Strength and reliability: robust structure in steel, new high strength balancing springs, and elliptical section bar with high wind-gust resistance. Optional flashing or traffic light can be integrated in cover. Encoder movement control and electromechanical limit switches. Modular: bars are easily assembled using the aluminium expansion joint. operation. It is ideal for private, public and industrial applications. 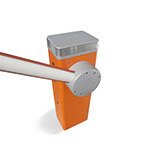 With a sleek look and innovative break-away arm design the signo will handle all your barrier arm needs. The signo uses the nice user-friendly control unit that upgrades the barrier to a number of nnovating features. The recommend arm lengths are up to 20ft. 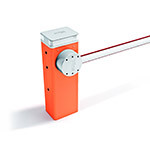 The Apollo BA12T Barrier Arm Operator is designed to handle a barrier arm up to 16 feet in total length. Apollo Operators are available only through qualified dealers with an outstanding reputation in the fence and gate industry. These dealers will be able to recommend the proper equipment for particular applications. Apollo BA12 Arm Barrier Operator The Apollo BA12 Barrier Arm Operator is designed to handle a barrier arm up to 16 feet in total length. Apollo Operators are available only through qualified dealers with an outstanding reputation in the fence and gate industry. These dealers will be able to recommend the proper equipment for particular applications. Apollo offers its 110 vac barrier arm operator (24v dc motor) with available battery back-up that can be used for commercial continuous duty operation. It is ideal for private, public and industrial applications. With a sleek look and innovative break-away arm design the signo will handle all your barrier arm needs. The signo uses the nice user-friendly control unit that upgrades the barrier to a number of innovating features. The recommend arm lengths are up to 12ft.